Possibly even better than last year! We certainly had the most visitors of all time. People came in such a steady stream this year that the most of our "surprises" were not very surprising. It was still lots of fun and we still scared lots of people. We probably received more compliments this year than in all previous years combined. This year my father came over the night before to help me setup the columns and fence. The rest we setup on the 31st. We were finished by 2 pm, which was a record! It helped that we didn't bother with the pirate ship this year. It was a nice attempt, but it just didn't look right. Perhaps I can try something like that in future years. Due to the steady (and increased) stream of visitors, we went through about $100 in candy between 6 pm and 9 pm. When we had our first gap of 10 minutes or so, we made the decision to start breaking everything down. It was a good decision, because we only had one more group come through betwen 9:30 and 10:00 pm, and they had already been through once before (new parents this time). We got everything put back in the house in less than an hour! 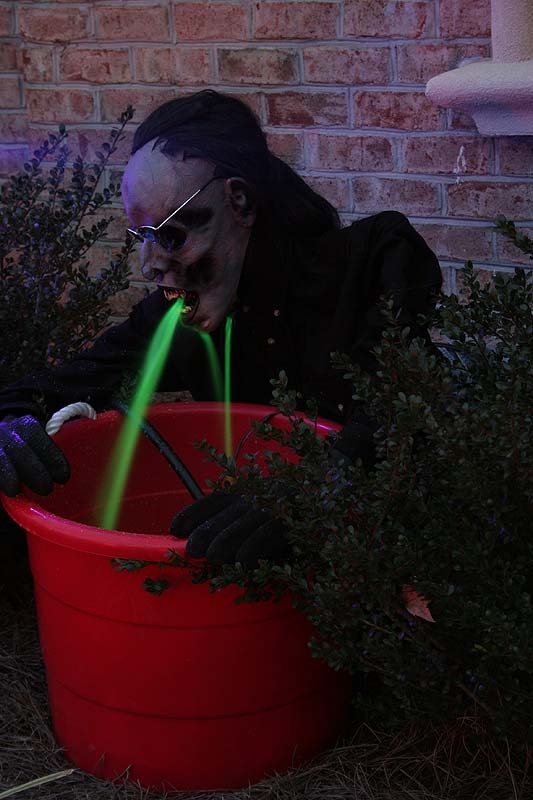 The only thing we left outside was the "vomiter" as he was still covered in glass (a blacklight bulb popped right beside him). The pictures below show many of our props (and the kids). Once again I had a few props that I couldn't make work, so I have more work to do for next year. If you have any questions, feel free to contact me. My second attempt at the lawnmower man (based on a design I found on Scary Terry's site. The prop stopped operating after 5 minutes last year. This year I rebuilt most of the mechanism and thought I had it working just fine. When I put the prop in the yard, it ran like a champ for about 20 minutes, then just stopped. It was already dark and I didn't want to spend the night digging into the "guts" of the guy, so I just unplugged it an moved on. I added a soundtrack this year, so I left that running. I have not yet autopsied the remains, but I would guess that the 12 volt power supply shorted out. 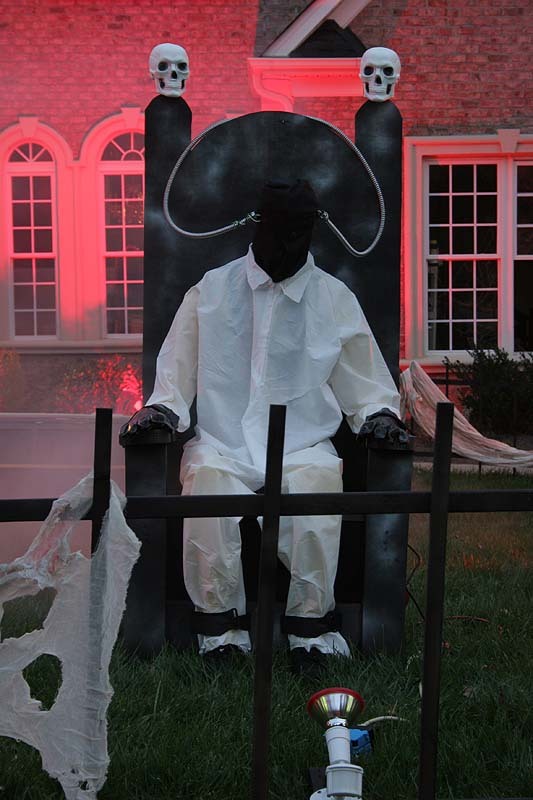 The electric chair was new this year and it was a hit. Lots of people just stood there to watch it run. The chair came from a neighbor who no longer needed it for her Halloween show. I built a PVC torso that fitted over a pipe mounted on the seat. Then I attached a drill, fog machine, and a sound system to make a fairly impressive prop. I hooked up a motion sensor in test mode (4 second run time per triggering). 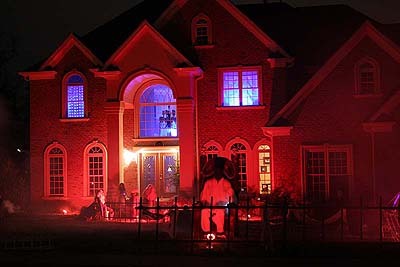 The speakers were powered by the motion sensor, so when the drill and lights came on, so did the screaming/shocking sound. Sadly, after about 90 minutes of fairly steady activiation, the drill overheated and died. It literally melted the housing. I guess I was lucky it didn't just catch fire. 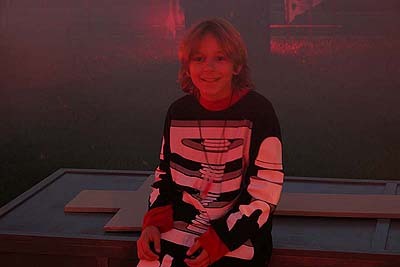 The fog machine also had some trouble. I filled it twice that night (other two fog machines only filled once). When the fog juice ran out the second time, I just turned it off. I'm afraid there may be some kind of leak in the storage tank. 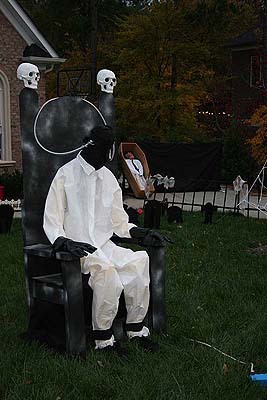 I plan to rebuild the electric chair for next year. Hopefully I can do it without melting another drill. My air-powered props didn't do so well this year. I didn't test any of it in advance. I guess I shouldn't be surprised that they didn't work properly. I'll have to spend a little time working on them this year. Once again I used a gas-powered generator to provide most of the electricity for my setup. My house circuits just aren't up to the task. It was very effective and really made it easy to light it all up. Just click on the pictures below to see a larger version of the image. 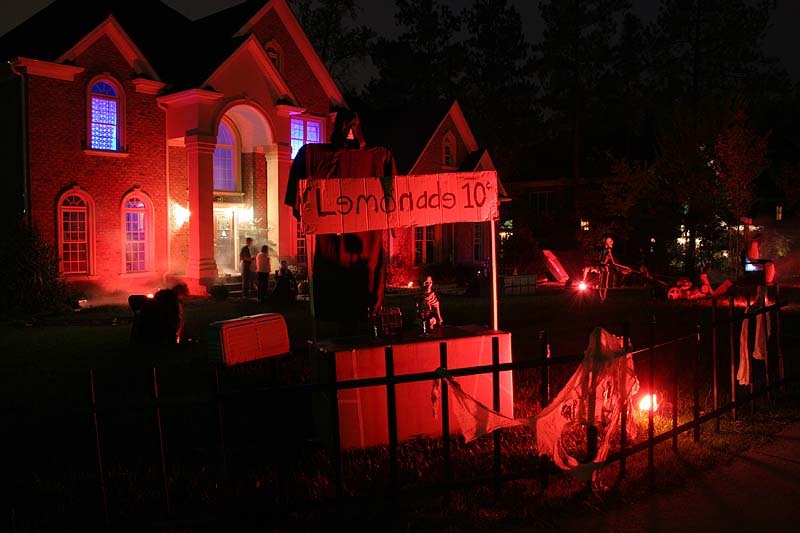 View from the corner, looking directly at the new "Lemonade" Stand. View from directly in front of the house. 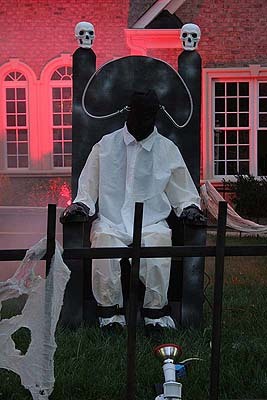 In the foreground is the electric chair, with the great red/blue contrast of the interior lighting behind. 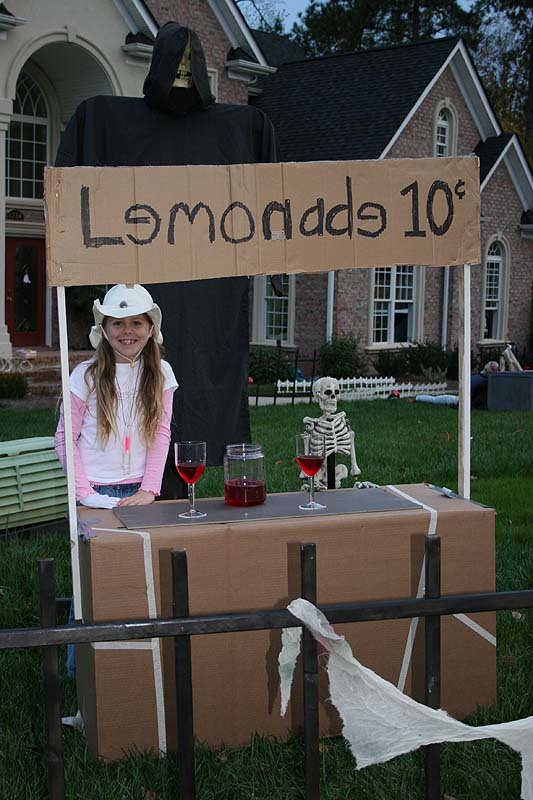 Tessa posing with a Lemonade Stand that was a prop for a recently filmed corporate video. Keegan and Tessa both were part of the shoot. 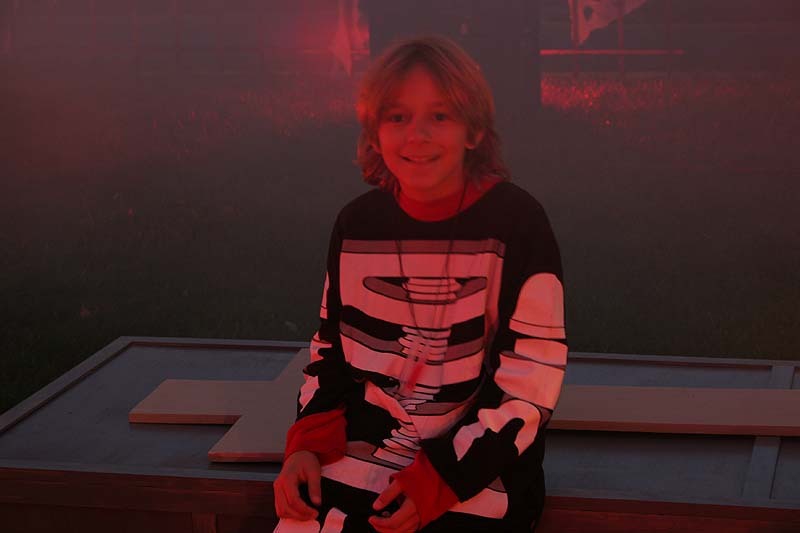 Keegan sitting on a coffin in his costume, a Lego skeleton. 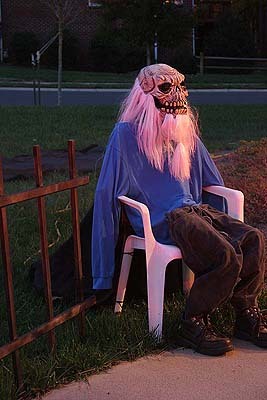 He did a little Trick-or-Treating this year, but he also spent a lot of time at home helping us scare the kiddies. My first disappointment of 2006. This prop simply failed to rise to the occasion. Good electricity and air pressure, but the cylinder either leaked or simply had too much resistance to lift the body this year. 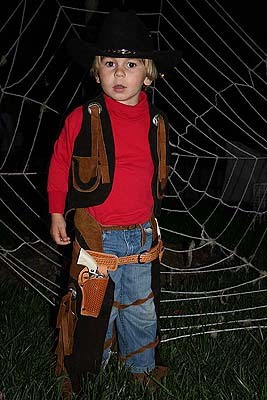 Elias, my little cowboy, posing in front of the 8' spider web. The Vomiter! Still one of the most popular displays in my yard. 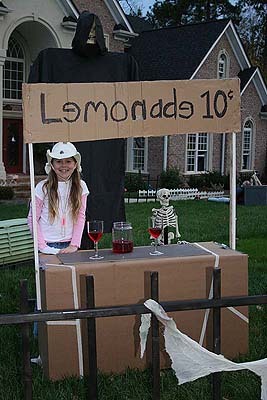 Many people visited my house for the first time this year because their kids made such a big deal about this prop after seeing it last year. 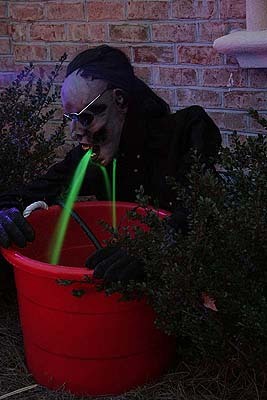 That liquid is just water with four highlighter wicks in the bucket. Apply a blacklight and voila! 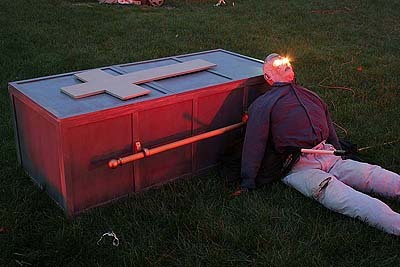 My homemade coffin, with a corpse leaning up against it. The little surprise here is that the corpse has an air gun firing 100 psi air blasts. It works fine, but I put him a little too far away from the sidewalk to really make the visitors feel it.